Marisa Perry Micro Pave exemplifies the finest diamond craftsmanship in the world. The artisans in Marisa Perry’s New York City workshop carefully set each diamond, under a microscope, into a handmade gold band. The process begins with our metalsmiths hand forging a band of gold or platinum in the same manner the goldsmiths of old used to do. This part of the process is essential as it ensures that the metal is durable enough to undergo the process of becoming a micro pave band. The band is then measured and the stone setter and Douglas Elliott, our designer, plot out how many diamonds will go into the band. Douglas then hand selects each diamond, making sure they are perfectly calibrated so that the final product is perfect. Our master stone setter then carefully sets each diamond into the band and handcrafts prongs for each diamond. Each diamond in a Marisa Perry Micro Pave Eternity Band is set with as much care and attention as a diamond in an engagement ring. The process of making these bands is incredibly labor intensive and the perfect final product can only be executed by the most skilled stone setters in the world — fortunately they work for us! Marisa Perry Micro Pave Eternity bands are available in a variety of precious and semi-precious gemstones. 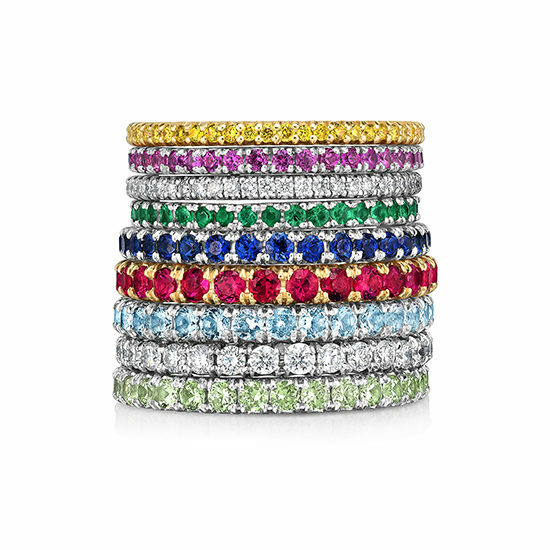 Call or write [email protected] to discuss having a custom made colored stone eternity band made bespoke to you. Bands can be set in 18k rose gold, 18k yellow gold or platinum. While we can set any semi-precious stone in our eternity bands many semi-precious stones are soft and we would not recommend setting them in a micro-pave band that you intend to wear daily. After a diamond the hardest stones are Sapphires and Rubies. Emeralds, Aquamarines, and Garnets can also be set in our micro pave bands.